This banana bread recipe is so easy and delicious it will make you wonder why you don’t bake more often. Everyone loves banana bread. It is one of the quintessential comfort foods that never goes out of style. Mix the sugar, butter and eggs for 3 minutes. Add the flour, baking powder, baking soda, salt, walnuts and mashed bananas. Grease a regular size loaf pan. Pour the batter into the loaf pan and bake for 1 hour or until a toothpick inserted into the center comes out clean. Replacing the sugar with a sugar substitute like Splenda or stevia turns this into a great Diabetic dessert or a treat that those of us watching our calorie intake can enjoy in moderation. Add extra walnuts on top of the bread before baking for extra crunch. 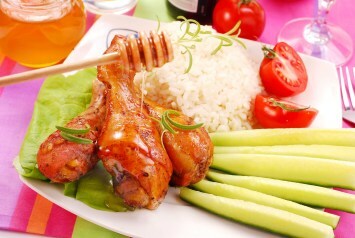 See the tips and recipe variations from other visitors below. You can make this banana bread recipe even healthier by replacing 1/2 of the white all purpose flour with whole wheat flour. It won’t harm the texture of the cake if you sift the flour before you add it, and it ups the nutritional value of the recipe. I love having a couple of loaves of this banana bread, sliced, in my freezer. That way, any time unexpected company arrives, I always have something delicious and homemade to serve them. Baking this easy bread is a great way to use up those overripe bananas the family doesn’t want to eat any more. This is an easy sweet treat that’s also a healthy food choice. Can’t beat that combination. Best of all? Kids love it! It’s a great way to get fruit and nuts into picky eaters. 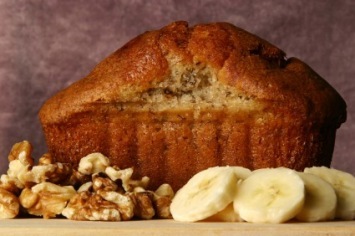 If you like this banana bread recipe, try our other easy bread recipes. You’ll find them here. Mix the sugar, margarine and eggs for 3 minutes. Add the flour, baking powder, baking soda, salt, walnuts and mashed bananas. so moist and so delicious. Really, easy, really moist, really delicious. Really good recipe. 1. Place the slices of bread in the toaster. 2. Spread on each slice of bread. Slice the banana into thin pieces. 3. Place on top of the slices of bread. Place the slice on top of the other. Cut diagonally. Serve on a plate. Hi. I haven’t tried this recipe before but I am looking quite forward to making it. It seems really easy and simple, so thank you for this recipe. perfect recipe for a non_baker like me!! I have made it three times in a month now!!! try chocolate chips mixed in as well, or sprinkle some oat bran on top before baking for added fiber!! I never thought banana bread would be this easy. I did not have to go out to the store to buy any ingredient at all. easy to follow taste good… add some cinnamon or sugar on top before baking…… guys one to use to impress the ladies. This was one easy peasy recipe. Thank you! Made and in the oven in less than 10 minutes. An hour later…a fantastic desert for the company that popped in unexpectedly. Thank you!!! Thanks Angela. So nice to hear. And thanks for taking the time to write.